Tired of Dealing with Knee Pain? Want to Know More About Your Options? We understand that making sure you know what to expect from your total knee replacement experience is important to you. As you are reading through this material, if you have additional questions please reach out to us to discuss. Each patient is unique and can experience joint pain for different reasons. It’s important to talk to us about the reason for your knee pain so you can understand the treatment options available to you. Knee pain from arthritis and joint degeneration can be constant or come and go, occur with movement or after a period of rest, or be located in one spot or many parts of the body. It is common for patients to try medication and other conservative treatments to treat their knee pain. If you haven’t experienced adequate relief with those treatment options, you may be a candidate for Mako Total Knee replacement, which may provide you with relief from your knee pain. Mako Robotic-Arm Assisted Total Knee replacement is a treatment option for adults living with mid to late-stage osteoarthritis (OA) of the knee. 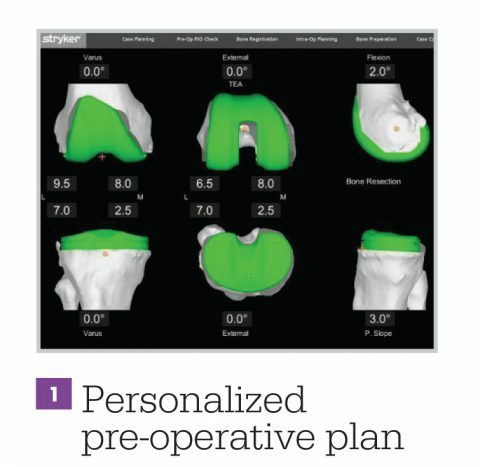 Mako provides you with a personalized surgical plan based on your unique anatomy. First, a CT scan of the diseased knee joint is taken. This CT scan is uploaded into the Mako System software, where a 3D model of your knee is created. 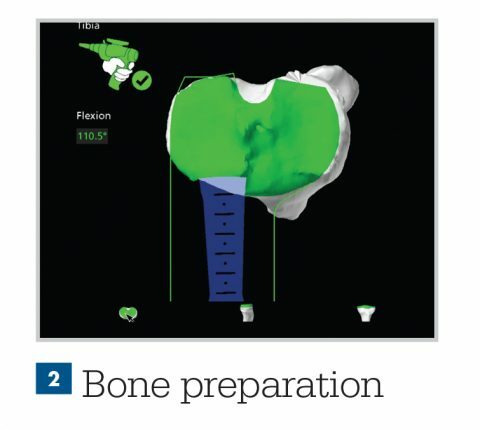 This 3D model is used to pre-plan and assist your ortopedic surgeon in performing your total knee replacement. In the operating room, your surgeon follows your personalized surgical plan while preparing the bone for the Triathlon Total Knee implant. With over a decade of clinical history, the Triathlon knee replacement is different than a traditional knee replacement because they are designed to work with the body to promote natural-like circular motion. The orthopedic surgeon guides the robotic-arm to remove diseased bone and cartilage within the pre-defined area and the Mako System helps the surgeon stay within the planned boundaries that were defined when the personalized pre-operative plan was created. In a laboratory study, Mako Technology demonstrated accurate placement of implants to a personalized surgical plan. It’s important to understand that the surgery is performed by an orthopaedic surgeon, who guides the robotic-arm during the surgery to position the implant in the knee joint. The robotic-arm does not perform surgery, make decisions on its own, or move without the surgeon guiding the robotic-arm. The Mako System also allows your orthopedic surgeon to make adjustments to your plan during surgery as needed. Mako™ total hip replacement is designed to restore mobility and an active lifestyle. It accurately places your hip implant using the surgeon-controlled robotic-arm system. The direct anterior approach involves a smaller incision, no detaching of muscles or tendons, improved positioning, equal leg lengths, decreased dislocation rates, as well as a shorter hospital stay. Bilateral total hip arthroplasty is a procedure in which both diseased hips are replaced. 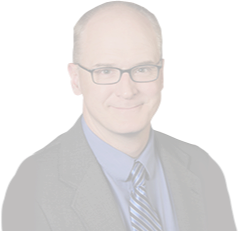 Dr. Stewart began performing bilateral total hip arthroplasties in 2015 for patients with severe osteoarthritis in both hips. Hip arthroscopy is a minimally invasive surgery that is performed through 2-3 very small incisions to evaluate and treat a variety of hip conditions. While the BIRMINGHAM HIP* Resurfacing implant is new to the United States, it is not a new implant or technique. It has been in use worldwide since 1997.